The story of Raving Rabbids can be summed up in a few sentences. Rayman's world gets invaded by a bunch of Rabbids (crazy Rabbit-like animals), in the process he gets kidnapped and taken to a Rabbid base. 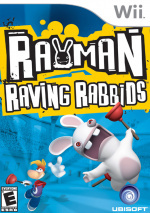 In order to survive, Rayman must spend each day of his captivity entertaining the Rabbids in their own version of Colosseum games. Upon completing each days games, Rayman gets awarded with... a plunger; what prooves to be a vital escape tool. 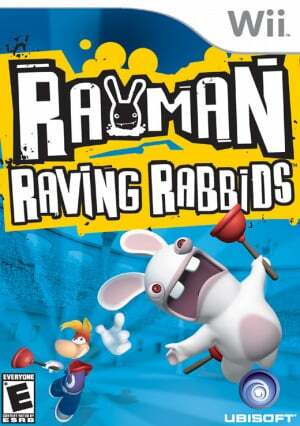 With 75 mini-games, Raving Rabbids doesn't exactly come close in terms of quantity to the likes of WarioWare. However it more than makes up for this with quality and vast amounts of side-splitting humor. Most of the mini-games last for a few minutes and feature a variety of hilarious scenarios. On top of this they are well presented, with only a few adopting the simplistic style of WarioWare. Practically every mini-game involves some sort of bunny related violence; including bowling down a group of Rabbids, hitting the poor things on the head with a hammer, slapping them when they sing out of tune, or even kicking them like a football. You really can't help but laugh at what happens to the Rabbids. Quite a few of these games are repeated throughout the single player campaign, only they get slightly harder each time. Almost every in-game day consists of a dancing and shooting mini-game; no real issue here as they are great fun to play. Nearing the end of the story these games start providing a decent challenge for those avid Rabbid players. Multiplayer mode is a bit of a letdown for Rayman Raving Rabbids. As most attention has been placed on the single player side a lot of the games will not support simultaneous players. Having your friends play each round in turn slightly dulls the fun that could have been brought from the multiplayer experience. Of course there is still enjoyment to be had, and games like the dancing stages allow for simultaneous play. Visually the game is nice to look at, if not exactly perfectly polished. Some of the animations on the Rabbids, mixed with their bizarre sound effects, really heightens the humor. The core gameplay more than makes up for any lack of real next-gen feel. If you like mini-games and crazy French rabbits, the chances are high that you will love this game. "the games are going to keep you wiily fit." This line made me Cringe. Good review bro a must game for any wii owner. I have some how avoided all the Rabbid games throughout the Wii's lifetime, but I saw a Rabbids collection with 3 of the games on 1 disc for less than $20:00! !